Use this compact high-performance video light anywhere you need a bright, steady light: with video cameras, digital cameras, or as a personal dive light. 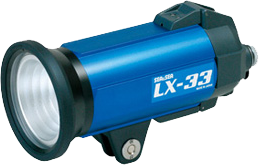 A lightweight and compact 33W underwater light; excellent for underwater video lighting, as a modeling light for still photography, or as a personal dive light. A light-control dial adjusts light intensity to suit the subject at hand. Provides up to 100 minutes of continuous lighting when fully charged. Attaches to a housing using an optional Sea Arm and Flexible Light Arm.